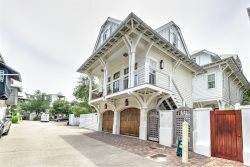 'Beachy Keen' South-side of 30A Inlet Beach Vacation Rental House! Perfectly Located Steps from Rosemary Beach and All 30A East Has to Offer! The open concept living space is perfect for entertaining. Beachy Keen at Dusk The fabulous outdoor space at the home is accessible from the game room. Beachy Keen aerial view. Pinecrest is literally next door neighbors to Rosemary Beach, FL The living space is filled with light, a flatscreen TV and decorative fireplace. The dining space has seating for 8 at the table and access to the back patio. The chef`s kitchen has a wine fridge, ice maker and large island. Another view of the outdoor space which includes a gas grill on the patio. 1st floor master bedroom with a king bed and flatscreen TV. 1st floor master has an ensuite with large soaking tub and marble details. The gorgeous 1st master bathroom has 2 vanities and a large walk-in shower. The game room is the perfect hang out spot with a bar top, Foosball and TV. The game room has large sliding doors that lead directly to the outdoor space. Beachy Keen Aerial View - Perfectly Located South Side 30A Luxury Vacation Rental This 2nd floor master has a king bed, ensuite bathroom and flatscreen TV. Another view of the 2nd floor master with a unique window detail. 2nd floor bedroom with a king bed and a set of bunkbeds with a full and twin. Another 2nd floor master with a king bed and flatscreen TV. Another view of the bedroom that also has an ensuite bathroom. The bathroom attached to the 2nd floor master with double vanity. The bunk room is perfect for the kids with 2 sets of twin bunks and flatscreen. The 2nd floor loft overlooks the main living space and the all the homes details The 2nd floor loft also has a great coffee bar. The Pinecrest community pool is steps from Beachy Keen. Another view of the front of the home and the outdoor space. The stunning entrance of your beach vacation home. “Beachy Keen” is a custom 5 bedroom, 5 1/2 bathroom home in the gated community of Pinecrest. This stand alone private community is located between 30a East's 2 most popular neighborhoods, Rosemary Beach and Inlet Beach. Pinecrest also has a community pool that is shared between the homes. This gorgeous home is also located steps from the Emerald Coast's most beautiful beaches where you can relax in your FREE beach chair set up (seasonal*). If you don't feel like walking to the beach, or the shops and restaurants in Rosemary Beach then hop on one of the 5 bikes provided with this home. “Beachy Keen” has been carefully designed with coastal details and 5 star amenities. As you pull up to the home you will have parking for two vehicles. When you enter the home you immediately see the charming details that make this home unique. You will notice the barn door style window that looks over the game room which features a large flat screen TV, Foosball table, lounge area seating and bar top with stools for those who want to catch the next game of Foosball. The game room leads out to the patio and yard. There is also a Sonos music system so you and your guests can enjoy your favorite tunes. The first floor Master bedroom has a rustic, wood planked ceiling and a soothing gray and white color scheme, the perfect backdrop for the beach. This master suite has a king sized bed and large, flat screen TV. The en suite bathroom continues the beautiful details of the home with marble covering the floors and surrounding the soaking tub and walk-in shower. There are also two separate vanities with marble countertops so you will have plenty of room to spread out. The spacious master closet is off the bathroom and you will be able to fit all of your luggage with room to spare. The open concept living area features high ceilings with the designer details spreading from the walls, light fixtures and the beautiful, seashell columns. The living area has plenty of seating for guests around the flat screen TV and decorative fireplace. The dining room features a round table with seating for eight with additional seating for 3 off the dining room at a bar top. The gourmet chefs kitchen off the dining room comes complete with stainless steel appliances including an ice maker and wine fridge, marble countertops and a large island to prep a gourmet seafood meal or a quick snack for the beach. There is also a door off the dining area that leads you to the back patio which has a gas grill. The large laundry room as well as a half bath with marble countertops complete the first floor. Head to the second floor and you'll find the remaining bedrooms. You will also find a loft area with a coffee bar and seating bench that overlooks the living space below. There is a full bath that can be shared by all and that has a tiled tub/shower combination. On this floor you will find 2 private master bedrooms each with a king bed, flat screen TV and en suite bathroom both of which have a single, marble topped vanity and tub/shower combination. The 2nd floor also has a fun bunk room with 2 sets of twin bunks (sleeping 4) and a flat screen TV. If you walk through the bunk room you will find the final bedroom with a king size bed and flat screen TV. This room also has custom built-in bunks with a twin on top and full on the bottom. There is a bathroom off of this bedroom with a standup, walk-in shower, marble vanity and plenty of storage. “Beachy Keen” is sure to impress all of its guests with the unique detail, charm and amenities it has to offer. This home is the perfect backdrop for your family to make memories at the beach.